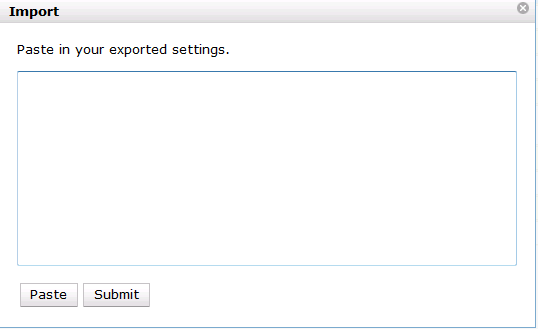 To export library settings, click the Export button on the above Library Setting Editor screen. Click Copy in the pop-up window. 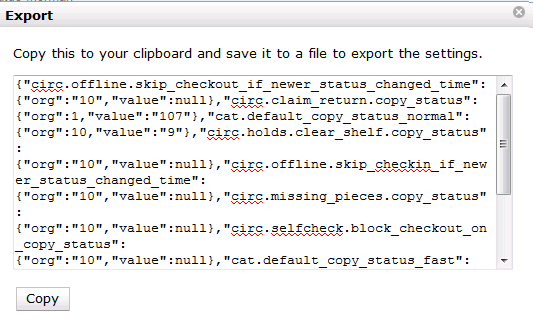 Those settings displayed on the screen are copied to the clipboard. Paste the contents to a text editor, such as Notepad. Save the file on your computer. To import library settings, click the Import button on the Library Settings Editor screen. Open your previously saved file and copy the contents. Click Paste in the pop-up window. Click Submit.